Romantic Cherry Blossom Elopement Inspiration. Back in April I drove from here in Richmond up to Washington DC to be a part of a styled shoot amongst the cherry blossoms. For those of you that don't know, the DC cherry blossoms bloom every spring for a very short window and they are breathtaking. Jenna Henderson is the photographer behind the beautiful images. Jenna is from Nashville, Tennessee and was in DC for an engagement shoot and wanted to take advantage of the cherry blossoms and put on a styled shoot. Of course I was in! Hello! Cherry blossoms and one gorg BHLDN gown. Perfection! I wanted to create a bouquet that stood out. I wanted it to be romantic with pops of the most perfect reds. It was a simple shoot so the bouquet was really the only accessory. This was hands down one of my most favorite shoots to date. Jenna is an incredibly talented photographer and was I honored to have been a part of something so beautiful. A few weeks a go Jenna sent me a little note with a photo from this shoot which is now displayed in the One Sweet Office. So sweet, And I'm so so excited that it's being featured over on Style Me Pretty today! Eeeek! Pastels & Pine Styled Shoot. Being from South Florida snow was something I always dreamed of and now living here in Virginia I've grown to love it even more than I ever thought I would. There is just something about waking up the morning after it's snowed and experiencing that magical moment where everything is silent. 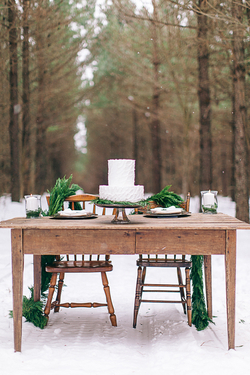 Lucky for me, the Pastels and Pine shoot ended up being on one of the snowiest days of the year and we were able to recreate that magic that I love so much in the form of one gorgeous styled shoot. And I'm super excited to have it featured on one of my favorite wedding blogs later this summer! Eeek! Ally Allison Events coordinated and styled everything and she couldn't have done a more amazing job. She wanted a winter theme but with pastel colors and I fell in love right away with her ideas. 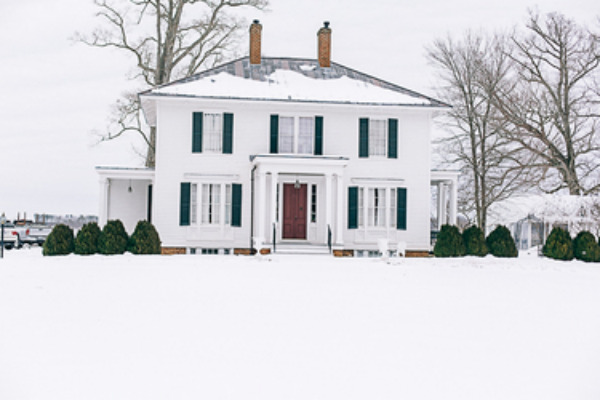 However, it ended up being one of the coldest, iciest, and snowiest weeks ever on record in Virginia there were definitely some obstacles we had to overcome. On the floral side, my wholesale order didn't get delivered on time because of the snow and caused me go into panic mode and wait at the Fedex ship center for hours. HOURS. The stunning blush gown our lovely model Holly is wearing was a last minute addition (like an hour before shoot time last minute) because our original dress was backed up with FedEx too! Welcome to the South haha...our cities can't handle anything over an inch of snow. One other obstacle? We set the alarm off at the venue and the police showed up. You should have seen us explaining to them what exactly we were doing lol. I'm sure they weren't expecting bride in a pink wedding dress out in 18 degree weather...We had permission to be on the premises, but no one ended up being there from the venue and we opened the door (granted there was a "come on in" sign and it was unlocked) and the alarm started blaring. Lesson learned. Once we got past our obstacles it was finally shoot time. And this was the result. A perfect romantic snowy scene. Nikki Santerre & Jessica Green are two of my favorite photographers and I think I will always be in love with their images from this special day. Can't you see why this is one of my favorite shoots EVER! It was so worth braving the 18 degrees to get this end result. Perfection. We were about to wrap up and then it started snowing ever so lightly. Like a dream. A huge thank you to our models who were such troopers and she may or may not be wearing thick leggings and Uggs under that dress. It was pure survival mode out there.